As you explore the isles of Ancient Greece in Assassin’s Creed Odyssey, you may come across the mysterious Ainigmata Ostraka riddles pointing you in the direction of some tasty treasure to be earned. You’ll get no quest marker for these, meaning it’s up to you to hunt down the end spot for each. If you get stuck, you can always follow our guides instead. This time we’re looking at the Record Sunshine Ainigmata Ostraka to help you recover its shining treasure. "An unusual request came to eliminate some records. 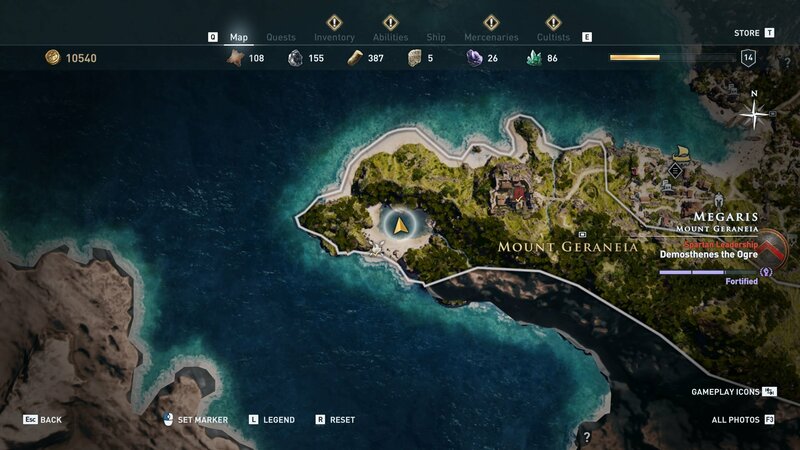 I didn't want any trouble so I took a small journey west to Mount Geraneia. Take a dive in the center of the way and find them on the shelf in a sunken ruin." While the clue quite directly points towards Mount Geraneia, you won’t be repeating the deep dive of the Bottomless Lake Ainigmata Ostraka. In fact, you won’t even need to climb the mountain in question. The Record Sunshine tablet is actually referring to the pool of water to the west of Mount Geraneia. It should be visible as an inland cove on the southern face of the tip of land. Swim out into the water and you’ll spot a number of floating pots. Dive down under them and you’ll spot some boxes and pottery on the bottom of the pool. Interact with the area here and the Record Sunshine Ainigmata Ostraka treasure will be yours!